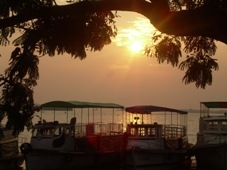 Cochin Marine Drive is a major attraction for both the tourists and the locals. Located close to the Arabian Sea in the state of Kerala, Cochin has long acted as one of the principal seaports of India. Marine Drive, also called as Shanmugham Road, is a long gracefully curving road along the seacoast of Cochin City, which is now called as Kochi. The view of the backwaters and the harbor from Marine Drive is really breathtaking. It is a beautiful and picturesque promenade in Kochi which faces towards the backwaters of Kochi. (Cochin). The locals and the tourists spend hours here in the 140-meter walkaway from the Jankar Jetty (North) to the Ernakulam Boat Jetty (South), which is paved with black-dotted, red-carpet ultra tiles, along the edge of backwaters walking, sitting, and watching the beauty of the blue waters of the sea. 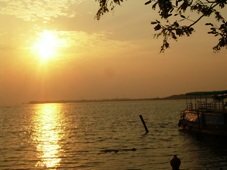 It is situated along the edge of backwaters that begins behind the Children's Park ending at the Shanmugham Road. For relaxation, cast-ironed, wooden benches, weather-proof seating on ash grey tiles and the breeze blowing in, are provided. You can see a number of country boats and motor boats parked at the other end of the walkway, which are available for rides in the backwaters. The Marine Drive walkaway is quite long starting from the High Court Junction and stretching until the Rajendra Maidan. Both the natives and tourists throng the walkaway in the evenings to enjoy the natural beauty of the sea, breeze, and other things around. Find out the best hotels near the Marine Drive using the Hotelscombined search engine.